In late 1845 Soren Kierkegaard began a literary duel with the satiric Danish review The Corsair that had momentous effects on his life and work. The affair prompted Kierkegaard to ponder and write about the use and abuse of the press. His reflections on this subject led him to examine topics that included communication, the public, the public morale, and the issues of social legitimacy, the relation of the individual to society and, surprisingly enough, the nature of the comic. Standard Kierkegaard biographies and interpretations generally perceive the affair as decisive in leading Kierkegaard to give up his idea of becoming a country pastor and in driving him to continue his prodigious literary output. 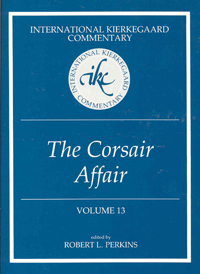 The Corsair Affair, the thirteenth volume in the Princeton series, is not like any other volume previously published or planned in the series. It contains only a few pages of Kierkegaard’s own published writings. His unpublished journals constitute most of the volume. The second-largest section reprints the cartoons and articles about Kierkegaard published in The Corsair and includes excerpts from the autobiography of Meir Goldschmidt, editor of The Corsair. Perkins states in his introduction that this commentary “is the first concerted effort by scholars of many persuasions, using different methods, to address this series of events and the concepts that were developed in and through them. … Here we make a fresh new start to work our way through a new set of concepts derived from these documents and our cogitations on them. In the process, we also enrich our treatment of concepts that have long been prominent in Kierkegaard research.” Three of the articles included in this commentary address Kierkegaard’s relation to the press. One is an expository article written within the terms of Kierkegaard’s own views, while two others place the affair in the context of a Marxist critique of modern media. Two papers address the issue of the comic—its central role in Kierkegaard’s conversations with Goldschmidt and its wider significance in the whole authorship. One essay attempts to sort through the interpersonal relationships. Finally, two articles treat matters not related to the Corsair Affair but to other newspaper articles published in the volume.